I have truly fallen in love with all the cities I've lived in. Nairobi, New York, London. They have all had a distinct energy and personality that has resonated with me. Nairobi: home, Africa, city under the sun, often lush and green, busy, people speaking my language. New York: Brooklyn, summertime, creativity unleashed in the most unexpected corners, my formative years. London: real, a mash up of people and activity, Brixton, Afri-love, SOAS, learning. And now I find myself in a very different city and one that, a year ago today, I would not have thought I would live in. Not for any particular reason: it just did not cross my mind as a possibility. This marks a very different stage of my life. I found myself in the previous two cities I lived in because of the pursuit of further education. This time I moved for love and sanity, and learning the nature of a new city, not being a student, is a very different experience. And I'm loving it. It is a slow process: on one hand I don't have the time reserves that student life affords and on the other, I know I'm going to be here for a while still so there's no rush. Let's call it my own slow movement. I am always interested in discovering the cultural life of a city – locating the creative nervous system if you like. Rainycitytales is somebody that is really doing (us?) Mancunians a great service. If you ever visit this side of the country/world, check that site out for ideas on what to take in (sights, sounds, taste…). Indeed it does rain a lot here but it also shines. A clear blue sky, bright light kind of shine that I don't recall as a regular feature down south in London. That's right, war of the cities begins! 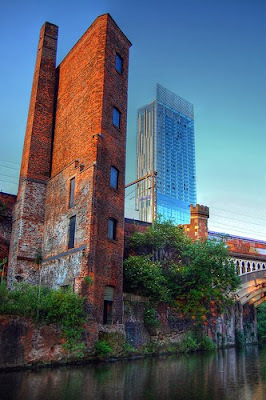 Photo by tj.blackwell, showing the juxtaposition that Manchester is! Around my last birthday, I made a vow to myself that, by the time I turned 27, I would be in a different place. A mental space different to the stressful, overly time- and energy-consuming one in which I lived. A place further along the path of realising the things I want for my life. - The time and freedom I craved to pursue my passions is there for the taking (in practice, I have not yet fully disciplined myself in order to embrace this time and freedom. It has been interesting to learn that the acquisition of liberation too requires discipline). One of the most significant things I have learned in this past year is that, articulating what you want is the most effective way of making progress towards getting it. - It wasn’t an end-point, merely a next step and so wasn’t too daunting and out of reach. - It was vague enough not to restrict how I needed to progress towards it. - It made clear where I didn’t want to be and thus the traps I needed to avoid. In short, acknowledging a profound desire, that wasn’t spelled out in perfect detail, helped me to recognize and seize the opportunities that life presented; that were to help me move forward. Because I did not set out a regimented plan, I was able to be flexible. I did not use a tunnelvision approach which may have made me overlook unexpected opportunities. Instead, I was open to the signs and aids of the universe. It is that powerful idea that, when we align ourselves with our rightful paths, the universe conspires to propel us along them. Everything seems to just fall into place. That once we mentally create space for this alignment, creation will rule. This week I’ve been thinking about what vow I will make to myself for the next year of my life. One thing that has come up a lot for me this year is values, in business settings and in personal ones. Indeed the barrier between those two worlds has crumbled for me in the context of values. Values are uncompromising: they define us and all we do. It follows that they should not be switched off between nine and five. Surely to do so renders us impersonators – of our true selves and/or of others? I went on an interesting Designer Breakfast some months ago. The topic of the particular session was looking at ways of working alternative to the traditional company structur, with a focus on partnership. Claudie Plen from Edge Thinking believed that key to successful partnership was an alignment of values, particularly the ones that are most important for each party concerned. I recently went on a refreshing two hour walk with an old friend I hadn’t seen in years and values cropped up again. This time in the context of relationships and how a union between people with incompatible core values is essentially a dead-end. All this talk of uncompromising values as first appears rigid and unrealistic. In life we often have to deal with people with whom we may not agree. However, keeping your values upfront can actually help rather than hinder. If everybody puts their values on the table, you can see where and how clashes may occur and you can then put measures in place to mitigate them. When you know what to expect, you can manage it better. That is, of course, if, despite the clashes, there is enough values resonance to make the partnership worthwhile. Sometimes they aren’t. Sometimes relationships expire. Acceptance of this fact has many-a-time eased my flow along that path the universe is taking me.